The ultimate addition to any Las Vegas enthusiast is this postcard. 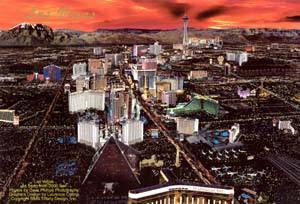 This image is the same as the famous Vegas Aerial Poster which has sold 100,000's of posters this yerar. Enjoy Las Vegas from an aerial view and get the perspective of this 24-hour city. Postcard size is 6 inches by 9 inches. Minimum order is 10, Free USA shipping on all quantities of 10-10,000. Orders processed within 48-hours and shipped First Class mail. Retail price per postcard is $2.50.